October 10, 2018 at 11:37p.m. Photo by Robert K. Yosay | Michael Carson, Martin Luther King Elementary second-grader in the Youngstown City Schools, tries snow peas as a 2 p.m. snack Wednesday afternoon. A $228,000 United States Department of Agriculture fruit and vegetable grant allows Youngstown City Schools students to try new vegetables in school. The snack program, said Sue Paris, food service director, is granted to lower income schools to introduce new and different vegetables to students within the district’s nine elementary schools. Students try new vegetables Wednesdays and new fruits Tuesdays and Thursdays. 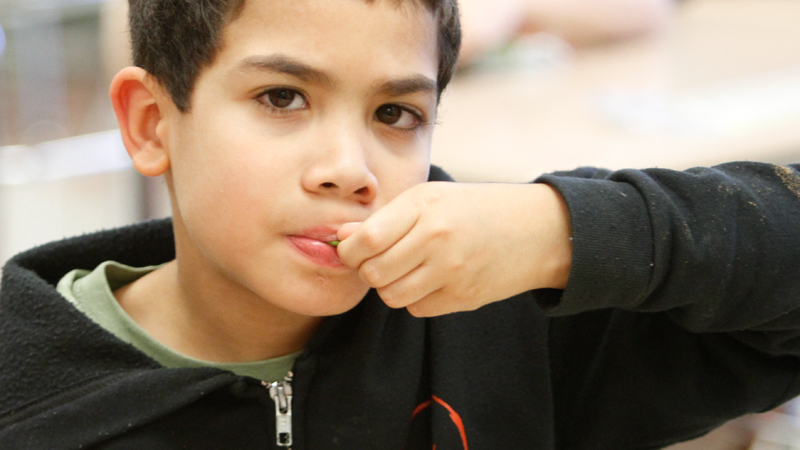 Second-graders tried snow peas Wednesday afternoon and had a variety of reactions to this new food. Some made cringe-worthy faces while others asked for more. “It tastes like Chinese [food],” said second-grader Yandel Abel Caraballo Garcia. Second-grade teacher Adrienne Fritz said she enjoys seeing students try new things. “I think it’s a great experience for our kids to try different fruits and vegetables they might not have experienced otherwise,” she said. Introducing students to new foods is an accomplishment to Brooks. “It’s like a goal and I’ve hit that goal,” she said. Some other types of foods the schools offer students include starfruit, papaya, mango and more. All the food comes fresh, washed and ready to eat in packages. Sometimes food service workers cut the foods into spirals or shapes to make them more appealing to students. Through a number of programs Youngstown City Schools offers students breakfast, lunch, a snack, supper and an evening snack throughout their days. In addition, students and staff throughout the district will participate in the Great Lakes Apple Crunch today to celebrate National Farm to School Month. About 11:50 a.m. today students from Youngstown State University will taste test different apple varieties at East High School. District high school students will get their apples during lunch and the fruit will be distributed to elementary school students about 2 p.m. as an afternoon snack. Apples – all locally grown – were delivered earlier this week to the district’s schools. The apples for the crunch came from Huffman Fruit Farm in Salem. The farm grows 31 apple varieties, 29 varieties of peaches, pears, plums and berries as well as many vegetables. Last October 2017, more than 1.5 million students, teachers and supporters in Ohio, Minnesota, Wisconsin, Illinois and Michigan participated in the Great Lakes Apple Crunch and organizers want to exceed that number this year. September 27, 2018 12:08 p.m.
November 12, 2011 12:01 a.m.